BOP ON TREND: Pumped Up Kicks. 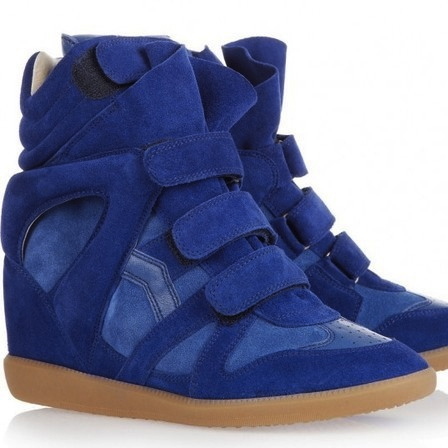 Wedge sneakers have been around for awhile now. At first I hated them. No, I despised them. I couldn't understand why someone would want a sneaker with a wedge. The concept both looked and sounded just stupid. And then, somewhat recently, it dawned on me - that I actually liked them. Like an elementary school crush, I was caught off guard with the fact that I actually liked what I thought was if anything obnoxious and not cute. Once I came to terms with reality, I had to snag a pair for myself. The Isabel Marant edition is pretty pricey but I found that Ash makes a very similar version for much less and they are extremely comfortable. I am now in love with them. I wanted to do a bop to show the pair I purchased, but alas, I live in New York where we anxiously wait for nor'easter Nemo to pass. A bop will have to wait until next week. In the meantime, I'm excited to see the different kinds of wedge sneakers that designers will come out with, Kate Spade included. P.S. These don't run in half sizes, so go up a euro size. I'm usually a 7.5 so I got a 38. I am starting feel the same way about this trend! At first I just didn't understand it but the more I see people rocking them (in very stylish manner of course)-- and now you are making me think that I should follow the trend too! Thanks for linking to a much more reasonably priced pair!